Ten-year-old Auggie Pullman, who was born with extreme facial abnormalities and was not expected to survive, goes from being home-schooled to entering fifth grade at a private middle school in Manhattan, which entails enduring the taunting and fear of his classmates as he struggl... read full description below. Library Binding, Bound for Schools & Libraries ed. #1 New York Times bestseller A School Library Journal Best of Children's Books 2012 A Publishers Weekly Best of Children's Books 2012 A Kirkus Reviews Best of Children's Books 2012 A Booklist Best of Children's Books 2012 Wonder is essentially ... a wonder. It's well-written, engaging, and so much fun to read that the pages almost turn themselves. More than that, Wonder touches the heart in the most life-affirming, unexpected ways, delivering in August Pullman a character whom readers will remember forever. Do yourself a favor and read this book - your life will be better for it. - Nicholas Sparks, #1 New York Times bestselling author Slate.com, October 10, 2012: Wonder is the best kids' book of the year. Entertainment Weekly, February 17, 2012, The Top 10 Things We Love This Week: In a wonder of a debut, Palacio has written a crackling page-turner filled with characters you can't help but root for. 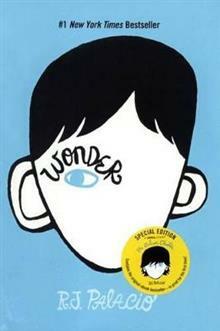 The New York Times, April 8, 2012: Rich and memorable...It's Auggie and the rest of the children who are the real heart of 'Wonder, ' and Palacio captures the voices of girls and boys, fifth graders and teenagers, with equal skill. The Wall Street Journal, June 9, 2012: What makes R.J. Palacio's debut novel so remarkable, and so lovely, is the uncommon generosity with which she tells Auggie's story...The result is a beautiful, funny and sometimes sob-making story of quiet transformation. The Huffington Post, March 1, 2012: It's in the bigger themes that Palacio's writing shines. This book is a glorious exploration of the nature of friendship, tenacity, fear, and most importantly, kindness. January 2013: I think every mother and father would be better for having read it. Auggie's parents -- who are never named in the book, and don't even get to narrate a chapter of their own -- are powerful examples not only of how to shelter and strengthen a child with heartbreaking facial anomalies, but also of how to be a loving advocate to any kid. The London Times, The Top 100 People to Watch in 2012: The breakout publishing sensation of 2012 will come courtesy of Palacio [and] is destined to go the way of Mark Haddon's The Curious Incident of the Dog in the Night-Time and then some. Full of heart, full of truth, Wonder is a book about seeing the beauty that's all around us. I dare you not to fall in love with Auggie Pullman. - Rebecca Stead, Newbery award-winning author of When You Reach Me It is the deceptive simplicity and honesty of the work that make Wonder so memorable. Every single character seems real and well drawn and oh-so human...This book is beautiful. - Christopher Paul Curtis, Newbery award-winning author of Bud, Not Buddy A beautiful story of kindness and courage. There are many real and well-developed characters, and they each have their shining moments. Of course, Auggie shines the brightest. - Clare Vanderpool, Newbery award-winning author of Moon Over Manifest Wonder is a beautifully told story about heartache, love, and the value of human life. One comes away from it wanting to be a better person. - Patricia Reilly Giff, two-time Newbery honor-winning author of Lily's Crossing and Pictures of Hollis Woods Wonder is a shining jewel of a story that cannot help but encourage readers of all ages to do better, to be better, in how they treat others in life. I'm totally in love with this novel. - Trudy Ludwig, anti-bullying advocate and author of My Secret Bully, Confessions of a Former Bully, Better Than You, and Just Kidding Starred Review, Publishers Weekly, February 20, 2012: Few first novels pack more of a punch: it's a rare story with the power to open eyes--and hearts--to what it's like to be singled out for a difference you can't control, when all you want is to be just another face in the crowd. Starred Review, Booklist, February 1, 2012: Palacio makes it feel not only effortless but downright graceful, and by the stand-up-and-cheer conclusion, readers will be doing just that, and feeling as if they are part of this troubled but ultimately warm-hearted community. Starred Review, School Library Journal, February 1, 2012: Palacio has an exceptional knack for writing realistic conversation and describing the thoughts and emotions of the characters...A well-written, thought-provoking book. Starred Review, Kirkus Reviews, December 15, 2011: A memorable story of kindness, courage and wonder.